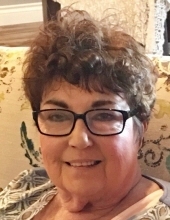 Cathy Ann Moccia, 77, of Midwest City, died March 28, 2019. She was born February 26, 1942 in San Jose, California. She was preceded in death by her parents, William and Doris Weeden. She is survived by her husband, Michael Moccia; daughter and son-in-law, Tammy and Richard Wilson; son, Thomas Miller; stepdaughters and stepsons-in-law, Maria and Scott Wolff and Michelle and Steve Casselman; granddaughter and grandson-in-law, Kelsey and Jase Chilcoat; grandsons, Jacob Wolff, Robert Wolff, and Matthew Casselman; great-granddaughter, Charlotte Ann Chilcoat; sister and brother-in-law, Linda and Monte Nelson and sister-in-law, Claire Hoosac. Funeral services will be held on Tuesday, April 2, 2019, at 10:00 a.m. at Barnes Friederich Funeral Home with interment following at Arlington Cemetery. Cathy was a wonderful and beloved wife, mother, “Nanny,” “Great-Grand-Nanny,” sister, and friend. Her family was the centerpiece of her life. For many years she cooked dinner for the family every Wednesday night. She was a great cook and only made things she knew everyone loved—comfort food. After dinner she always dragged out a deck of cards and she didn’t win often, but it didn’t seem to bother her. Cathy had a wicked sense of humor and a good taste for sarcasm. She loved April Fools’ Day pranks and scaring trick-or-treaters on Halloween. She coined a phrase that followed her sharp jokes: “. . . but I LOVE you,” which caught on among the family and became an old joke and way to remind each other we were always kidding. Becoming a “Great-Grand-Nanny,” was one of the greatest joys of Cathy’s life. In the time they had together, Cathy showered baby Charlotte with sweet gifts and all her love. She framed pictures of Charlotte in every room of her home and told everyone she saw about her new great granddaughter. Christmas was Cathy’s favorite time of year. She had decorations galore, including a rotating Christmas tree, complete with several spinning ornaments. Decorations for all holidays brought Cathy much joy, and brought her husband Mike much back pain, but he helped dutifully every year, nonetheless. Cathy was extremely proud of her Irish heritage and her enthusiasm for Christmas was matched only by St. Patrick’s Day. Cathy’s house was decorated with Irish nick knacks year-round including Irish blessings and four-leaf clovers. Cathy loved celebrating the birthdays of her loved ones. She could tell you all the famous people who shared a birthday with you. Somewhere along the way she acquired a battery-operated cake stand, which sang “Happy Birthday.” She got such joy out of “playing the cake plate” for her husband, children, and grandchildren on their birthdays and even if she didn’t get to see them that day, they would receive a phone call only to answer and hear the cake plate singing—often several times before the day was over. Cathy was a homebody, which meant she was usually available for a long phone call and her children and grandchildren called her often. She was always interested in the seemingly mundane details of their lives as well as the milestones. She would remember the slightest details—we said she had a mind like a steel trap. When someone in the family went out of town, she wrote down their itinerary so she could follow along with them. She made her family feel so loved. Cathy was a great historian of her life and the lives of those around her. She kept every photograph with notes on the back. She kept a chest full of memories, newspaper clippings from the end of WWII, the Kennedy Assassination, and keepsakes from the dates her loved ones were born. She scrapbooked, made shadow boxes, and kept in touch with friends and family who lived far away. Cathy suffered from rheumatoid arthritis for over thirty years. Throughout that stage of her life she remained undaunted by the challenges she faced. When she was no longer able to drive the QVC shopping network became a close friend, but she never complained. When she became confined to her bed for hours of the day, she took up coloring as a hobby and created beautiful gifts for her friends and family. Everyone who knew Cathy noted her courage, toughness, and ability to maintain a smile during hardship. She was a bright spot in the lives of those who knew her. She will be dearly missed. Cathy’s funeral service will be Tuesday, April 2, 2019 at 10 a.m. at Barnes Friederich Funeral Home with interment following at Arlington Cemetery. Viewing will be Sunday, March 31st, and Monday, April 1st from 8 a.m. to 8 p.m. with family present from 5-7 p.m. each night. In lieu of flowers, please donate to the Rheumatoid Arthritis Foundation or your favorite charity. To send flowers or a remembrance gift to the family of Cathy Ann Moccia, please visit our Tribute Store. "Email Address" would like to share the life celebration of Cathy Ann Moccia. Click on the "link" to go to share a favorite memory or leave a condolence message for the family.